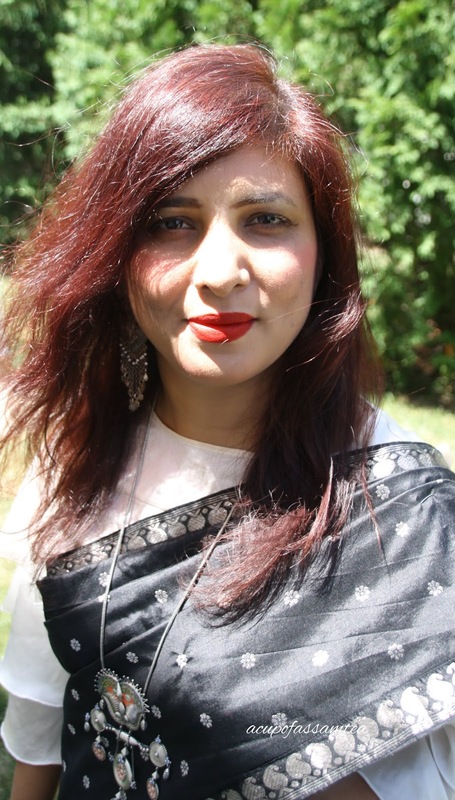 Designer: Sanjukta Dutta, the winner of the prestigious Dada Saheb Award for the best designer 2018, who designs especially traditional Assamese outfits, mekhela chadar treasures, and transports from the Brahmaputra to the Thames, the Ganges to the Hudson. Sanjukta's designs are a symphony of colors and medley of motifs from the traditional Assamese to the tribal tales around the world, a sheer visual delight. 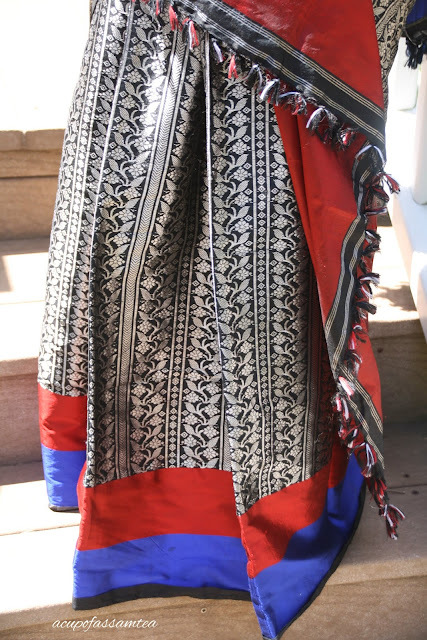 I chose this Crisp and charismatic black mekhela chadar woven with traditional Assamese motifs in silver that melds with the modern royal blue and crimson for the 2nd day of Assam Convention 2018. Got this mekhela chadar a couple of years back, but the best part of Sanjukta Dutta's mekhela chadar is that it remains trendy and classy even as days go by. While planning the outfit, I was a little overwhelmed while choosing the jewelry. Then I thought about this Amrapali necklace, I didn't have to think twice. Traditional mask motif is a very traditional Indian art form that merges into the modern muse. The mask reminds me of Majuli's mask making visit experience. 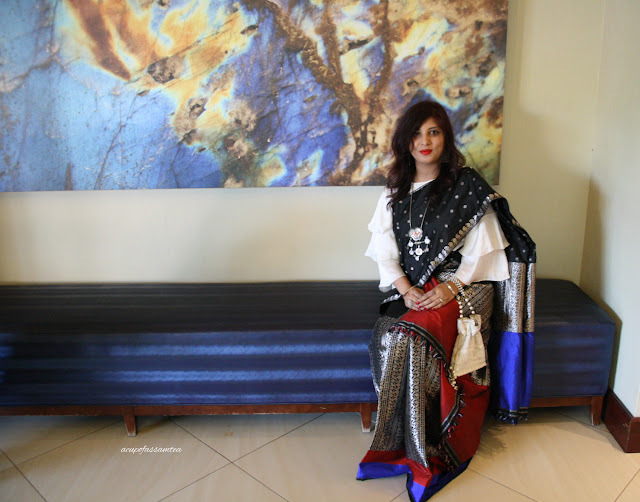 As I wanted to give the mekhela chadar a modern look, instead of wearing a traditional blouse, I wore a silk bell sleeve off-white crop top that blended well with Assam silk and a crochet potli to complete the look. Wearing the most traditional outfit of my home state, I incorporated the look with current trends, just like a woman of today who never leaves behind tradition yet always slaying the trends. I love your style! The colors are beautiful and your necklace choice turned out perfectly. I really do love the pop of royal blue with the red. Very pretty! Absolutely loved the sari! Just loved the colours. I also like the blouse you have paired up with this sari. Very unique. I love "keeping the tradition and slaying the trends! Awesome. Staying true without comprising style is crucial. I like the many colors and patters displayed on the various fabrics. The color flow options are right up my alley. I wear head scarves that allow me to highlight my artistic side and allow me to play with color. Wearable art! I love the color flow of the outfit you put together along with the traditions behind it. I love seeing the fashion styles and choices of other people's cultures and traditions. I love your outfit so much! The color and cut is absolutely beautiful. What I love the most, though, is that tradition behind it. I'm a big fan of learning about the "why" behind things. I really love your necklace with this outfit, it is stunning. I think that it also highlights the metallic work in the fabric as well. A great choice! This outfit looks beautiful on you. All the pieces go so nicely together. Perfect outfit for "slaying the trends". That mekhela chadar is stunning. What beautiful bold colors, all tied together with the silver. Your styling of the outfit is right on. That blouse lovely with the simple color and rich fabric. It sets of the mekhela chadar perfectly. Very beautiful and intricate style. I can tell you put a lot of thought into this entire outfit and it's accessories! You look confident & happy. There's nothing like that on a fellow woman. Keep moving forth in style & strength. This outfit looks beautiful on you! I love the bold colors, and that you are so comfortable wearing them! I wear a lot of dark colors, gray and black. Sometime I might venture out and wear something bright! You look stunning! The entire outfit is just perfect. From hair and make up to clothing and jewelry. Beautiful! Thanks for sharing a look into Assamese culture with us. I find all the variances of languages and cultures within the country of India fascinating. 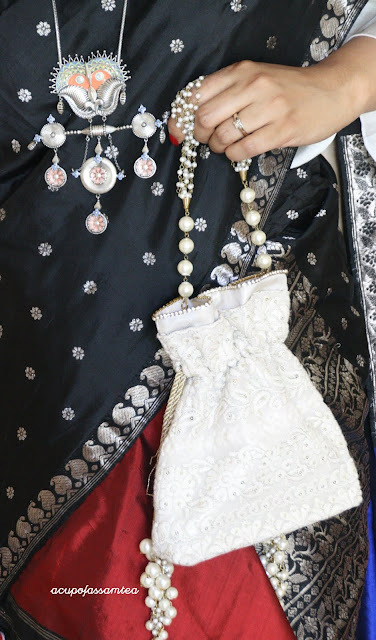 This traditional outfit is beautiful! That's a very pretty outfit. I love the red/blue accents! Love this style! You look lovely and the colours are great! I love your necklace and purse choices with this outfit. The necklace really stands out with the rest of the outfit. Thanks for sharing! Wow..beautiful color combo! I love it very much. I want to buy a sari like this.. I love the design and the colorful gown you have on. It really signifies that tradition you are keeping in. You look lovely. I just love your gorgeous saree ! A lot of detail on this very outfit, I always love it when people slay on their very own traditional outfits "proudly" this is Gorgeous! !